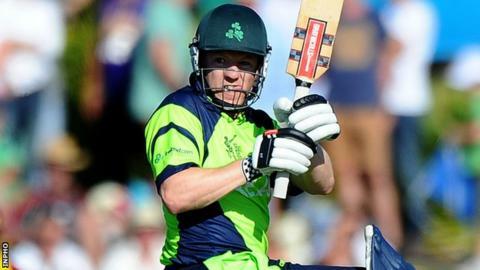 Ireland recovered from a jittery start to earn a 34-run win over the United Arab Emirates in Sunday's Twenty20 international in Abu Dhabi. The Irish slumped to 19-4 in their innings but a 55-run partnership by brothers Niall (38) and Kevin (23) O'Brien helped them post 134-8. UAE wickets fell regularly with Kevin O'Brien finishing with 3-14 as the hosts were out for 100 in 19.2 overs. Craig Young also took three dismissals with Boyd Rankin notching two wickets. The UAE's best partnership was a paltry 21 as Shaiman Anwar top-scored with 24. Ireland were in trouble early in their innings as captain William Porterfield and fellow opener Paul Stirling departed cheaply along with Stuart Poynter and Gary Wilson. However, the partnership put on by the O'Brien brothers steadied the Ireland innings with tail-enders Tim Murtagh (12 not out) and Rankin (16 not out) also chipping in with valuable late runs. Ireland will meet UAE again on Tuesday as they continue preparations for their World T20 campaign which starts against Oman in the Indian city of Dharamsala on 9 March. Speaking after Sunday's win, Kevin O'Brien backed Ireland's top order to come good despite their latest struggle. "I'm not worrying at the moment about the top order collapses," said the Irish all-rounder. "We just need to assess pitch conditions and perhaps play accordingly. "But we are looking to be positive when batting, so we can't go into our shells."